You’re right. Time for a sun shade. 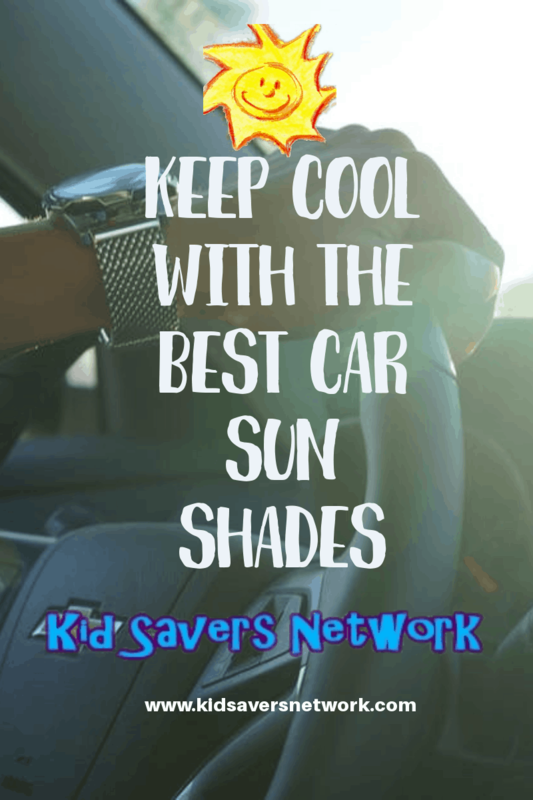 Using car sun shades is a great way to protect your children from UV rays and heat exposure. If you have a baby, getting window shades is even more of a priority. I have an infant (7 months) and a toddler (3 years old) and have first-hand experience of this. Keeping them safe from the sun and the heat is second to not crashing the car through lack of sleep (lol!). If they feel comfortable enough to actually fall asleep (the irony!) then it’s a massive bonus and I can concentrate on driving! In this article, we’ll take a look at the best car sun shades for you and your family. You can also skip straight to the reviews. burned through the window. But there’s another danger they help screen us from – the heat. 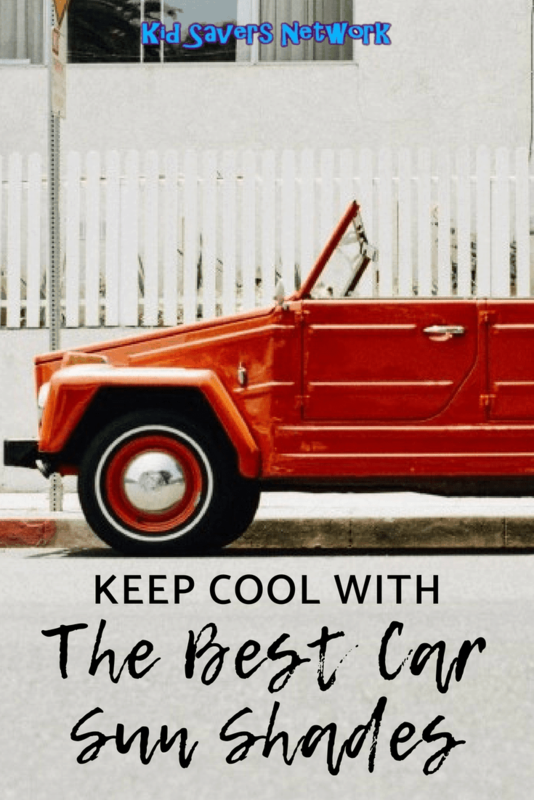 On a 90 degree day, it takes just an hour for the inside of your car to reach 140 degrees! So if you park up at the grocery store, by the time you come out (and everything takes longer with kids) the heat will be unbearable. The biggest increases occur in the first 15 to 20 minutes as well. It’s not just on hot summer days that you need to be vigilant. 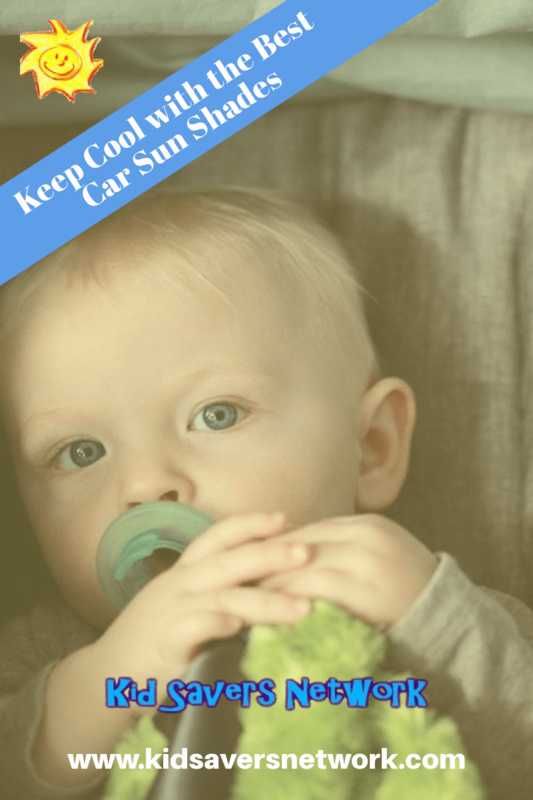 On 70 degree days you car can heat up to 115 degrees which is also dangerous for children, pets and the elderly. If you live in states like Arizona and California that get year-round sun, sun shades will make all the more difference. You can visit noheatstroke.org and get a great fact sheet with helpful tips and further information. 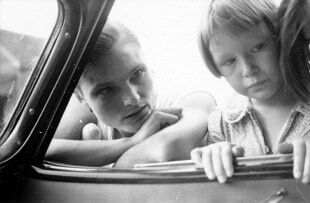 For adults, we usually suffer it for a few minutes until the air-con kicks in and handle the steering wheel like a hot potato. With kids, it’s a little different and extreme heat can cause heatstroke and death. The reason is their much smaller bodies heat up 3 – 5 times faster than an adults. An infant’s nervous system is not yet fully developed so they can’t sweat to reduce body temperature efficiently, either. 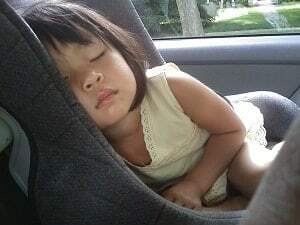 We have sunshades and air conditioning and noticed that our little girl became dehydrated during a 3-hour road trip on a particularly hot day. She was fine after a few hours (her urine returned to its normal color) but it really underlines how their bodies are different to ours. This also shows that it’s not just leaving kids unattended in cars you need to be mindful of, either. Now our son has just turned three he frequently says “I need shade!” – even if we’re in the underground car park of our condo…. In most (if not all – please check with your local DMV) sunshades are perfectly legal if they are placed on the two rear passenger windows. For the rear window, it’s usually o.k if you have two functioning side mirrors. There is an issue with the police wanting to see all occupants of a vehicle at all times. So it’s best to check your individual state laws. 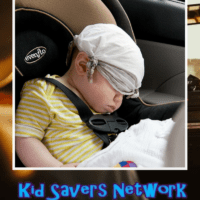 There are quite a few alternatives to sunshades that parents do use. In my situation is was really a “quick fix” and you’ll soon see why! You can hang a receiving blanket or towel in the rear windows but they often fall down and will soon get dirty. Training your child to wear a hat and sunglasses is also an option. This is fun (my toddler loves it) but is not practical for newborns. Also, it might save them from UV rays and glare, but it will do little for the heat that is building up in your car. Perhaps the best alternative is to get a tinted film or full-tint of the rear windows. As you’d expect, this option can cost several hundred dollars so it’s rather expensive. I also found driving in a tinted car to be difficult – especially at night due to the limited visibility. You can’t remove the tint like you can with sun shades. Take my word for it – good sun shades will save you a lot of hassle and are pretty inexpensive and you can see from our list! Now, I have a confession to make. We have a couple of cheap-o car sun shades that have plastic suckers on. They do the job, but we sometimes have to attach baby towels and bibs when the sun shines in a particular direction. That’s what motivated me to make this post and check out the best shades on the market. To my surprise, they’re a lot cheaper and better than I expected. I feel such a dolt for not upgrading earlier – but better late than never I suppose! 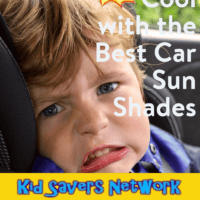 Shadesox’s Baby Sun Shade is one of the best-selling car window shades in 2017. They come as a pair and are incredibly easy to install and remove. Simply place the elastic fasteners over the edge of the window and the shade will stretch to provide 100% coverage. The material is listed as a “High-Quality Nylon” and has a pantyhose texture. The good news is that you can still see through the window with the shades attached. However, like a lot of sunshades, there will be blindspots if you’re looking over your shoulder to change lane or parking. To get round this you’ll need to use your mirrors more – which in my case took some time to get used to! For the price, they could well be the best car window shade for the money in 2017. The “Kinder Fluff” is another extremely popular car sun shade. There two main selling points are blocking out 97% UV light and not having any suction cups. This model is a slightly different design to the Shadesox and I believe there are a few pros and cons because of it. Firstly, it sticks to the window using static cling. This means you simply need to press it on and peel it off. They include a travel pouch so you can store them during the winter months safely. They also include 3 static cling shades and not 2, so you can either have a reserve or place it on the passenger window (you need to check local laws whilst driving, though). Some things I don’t like about this window shade is you can’t put the windows down. If you do this you’ll have to dig out the film. My toddler loves putting windows down and if I don’t forget to lock them this could be a problem. Secondly, due to the design, there’s no coverage for the small side windows. Most of the time, it’s not a problem with direct sunlight. However, I’d prefer to block all of the window. This is especially tue when the car is parked and the sunlight is moving around the car. A static cling shade design is great if you’re looking for something to use and remove. For my money, the 97% level of protection and extra screen make them better value than the popular Britax alternative. You can find the online price for the Kinder Fluff here. If you’re worried about a baby window shade creating blindspots, “EZ Shade” has the answer. The shades come with a zipper so you can zip down to see out of the rear windows. This is incredibly handy if you’re reversing into a parking space or baby is out of the car. You won’t need to constant install and remove the sunshades. Another big plus is it’s a “Universal Car Window Shade”, so it will work with most cars and SUVs. Parents even use them with their trucks but don’t expect 100% window coverage. Installation is done in seconds as the shades come with elastic that you stretch over the windows. A bit like putting on a sock! Like most car sun shades on the market, you need to expect a loss of visibility. However, I think the adjustable zip system is a great idea. The cost is also comparable to regular car shades, too! If you’re looking for baby sun shades for a larger car, check out these TFY Universal Sunshades. These shades are perfect for large rectangular windows as they are designed to fit up to 47” wide and 23” tall. To install them, you stretch them over the entire door frame so they cover both sides of the entire window – providing extra sun protection. You can only take them off by opening the door so they’re very secure. Their design means you can also roll down the windows and there’s no bunching of the fabric. An added bonus with this design is it covers the gaps between the window and door frame. This means it can keep bugs out of your car, too! A handy storage pouch is included so you have somewhere to stow them during the winter months. You need to be aware that these are not for smaller cars like a Nissan Versa or Subaru Forrester. Find the online price here. 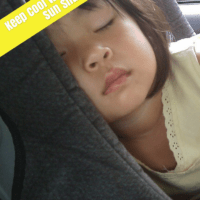 A rear sun window sun shade is a great idea for infants who are sat in rear-facing car seats. Unfortunately, you might have seen there aren’t that many different rear window designs to choose from. This is because the back window is bigger, fixed and without a door it’s hard to design a really effective car sun shade. Most of the problems seem to be around adhesion as there’s no window or door to attach them to. Having said that, I do like the “Ultra Shield” shade. Yes, it does have suction cups but they are pretty heavy duty. The only alternative is more of a sun–blind and this has two disadvantages. The first being you can’t reposition it. No “Universal” rear view window shade can be expected to cover all of your rear-window. So the cups let you find the best spot and keep some visibility, too. The second is the price. A rear window sun blind is considerably more expensive than The Ultrashield. The Ultra Shield also comes with a storage pouch and is 39”.5” by 19.5”. This makes it too big for smaller models of cars (think “Kia”).